As one of China's fastest-growing cities, Urumqi is a melting pot of international people and cultures set against a mountainous backdrop. Although originally a stop along the Silk Road under the Tang Dynasty, Urumqi only recently underwent full development, and now is home to 4 million people. As a result of its rapid growth, this modern metropolis attracts businesspeople from around the world. During your trip to Urumqi, you will enjoy a skyline that blends skyscrapers and the Tian Shan mountains, world-class shopping, and local cuisine. 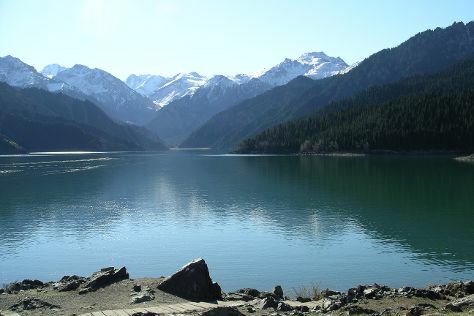 Use the city as a base for further exploration in the autonomous region of Xinjiang Uyghur. Urumqi is in Xinjiang Uygur. Explore the family-friendly attractions of Urumqi and add them to your vacation plans using our China road trip site . With over 700 places to stay throughout the city, Urumqi has no shortage of accommodations. As the region's largest city, Urumqi serves as a great base for wider explorations, though its luxury hotels are the most expensive in the area. However, this diverse destination also boasts hundreds of hotels and a decent number of well-equipped modern hostels, with something to fit every budget. If you prefer a different kind of experience during your stay in Urumqi, consider a short-term rental or smaller bed and breakfast.